CULLMAN, Ala. – Pablo Picasso once said, “Every child is an artist. The problem is how to remain an artist once he grows up.” It’s a favorite quote of West and East Elementary’s art teacher Judith McBrayer and a source of inspiration for her students’ art projects this year. 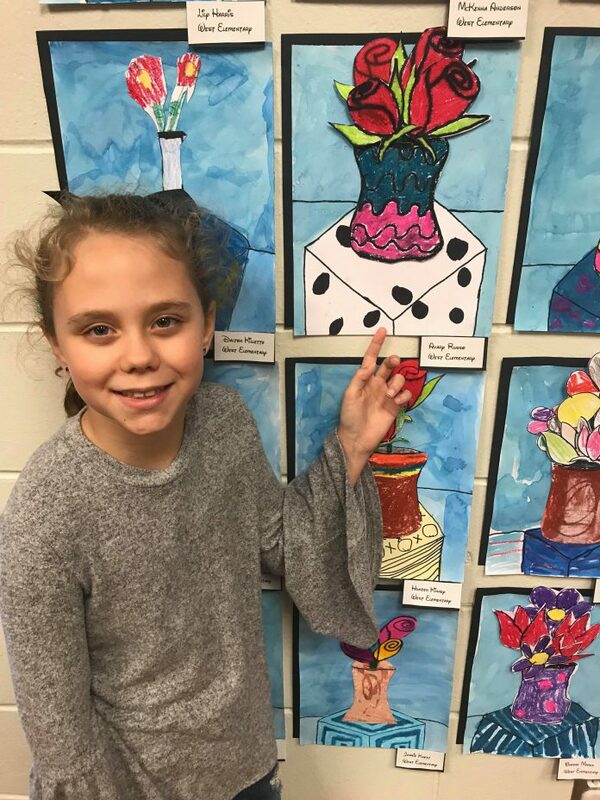 Approximately 1,200 students had their artwork on display at the WES/EES Art Show at the Cullman Civic Center on Friday night. Students and parents came to enjoy the vivid color and unique artistic styles. McBrayer has been teaching art at both elementary schools for 13 years and she was noticeably proud of all her students’ originality and hard work. The art exhibit showcased a broad range of styles and textures. Putting on a show including 1,200 students takes planning. “I start at the first of the year looking for different things they can do with different artists. From that I just start an art project and think about what they can do and think about what medium they can use,” McBrayer explained. This year’s show drew inspiration from many famous artists including Andy Warhol, Jackson Pollock, Leonardo DaVinci and Picasso. West Elementary third grader Avary Russo was excited to show her family her art project. Her class colored roses applied paper to give a 3-D appearance. She chose four roses in a large vase. Said Russo, “I used two colors for the roses. Rust and red.” The blending gave her roses a textured appearance. The kids were able to paint what they wanted rather than adhering to a chosen theme. “They took the ball and ran with it. They really did some awesome work,” McBrayer said. A great crowd came out to support the young artists and the schools’ art exhibit. McBrayer was greeted with many hugs and thanks.